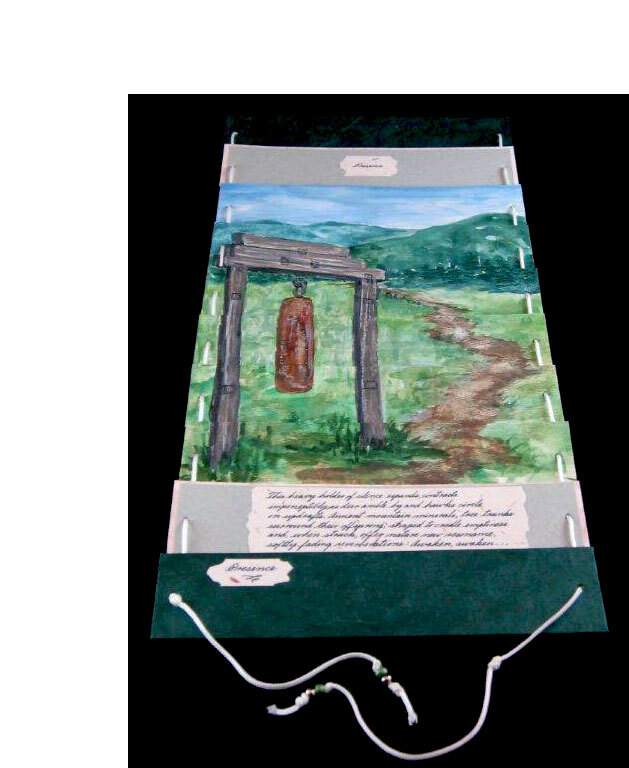 Pat Riviere-Seel, Western North Carolina Woman: " When Sharon Sharp talks about her work as a book artist, she keeps coming back to the word synergy. There's just no word that describes as accurately the melding of her lifelong love of books, her career as an editor, her work as a poet, and her desire to create art that involves all the senses." Boone, North Carolina: Curious Pursuits Press, 2014. One-of-a-Kind. 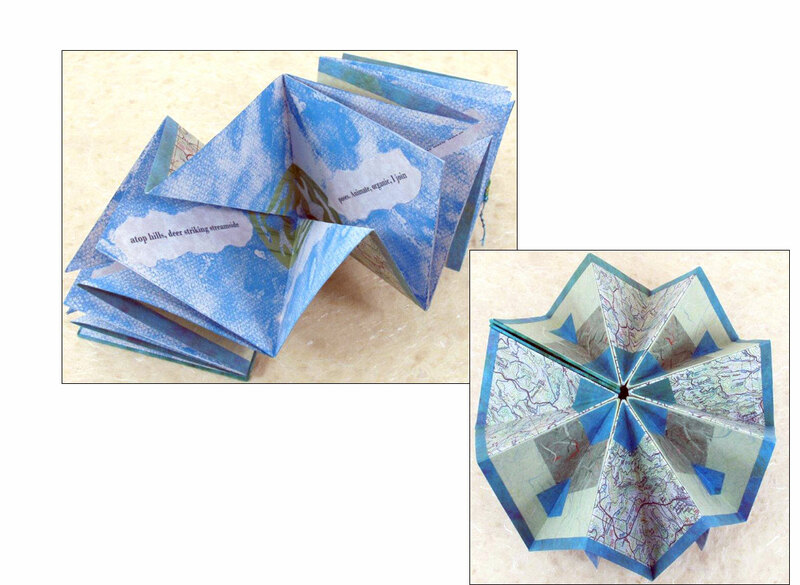 3.5 x 3.5" closed, opens to 10" diameter; 7 section tulip-fold structure. Materials: Nideggen, Canson, Canford, and kozo-and-banana fiber papers; metallic stamping ink for accents; Irish linen thread; glass beads. Processes: archival inkjet prints of original letterpress-printed collograph (skeletal leaf imagery); archival inkjet printing. Signed. Sharon Sharp: "During one particular late-autumn woodland stroll many years ago, I was struck as never before by the stark, intricate beauty of bare hardwoods' branches. Since that time, I have reminded myself to focus on what gifts the chill, howling winds of autumn will yield in my area. The original poem in Season's Sight was my first published poem, and I'm still honored that Sam Ragan, North Carolina's longtime poet laureate and a legendary journalist, published it (with a slightly different title) in The Pilot, the newspaper he edited. When I wrote this poem, I did not yet know about the field of book arts, so I've enjoyed bringing the words to life in a new way." Boone, North Carolina: Curious Pursuits Press, 2010. Edition of 10. 2.5 x 3"; 6 pages. Miniature. Double-sided accordion, panorama style (as designated by Hedi Kyle). Canson Mi-Teintes, textured angel-hair, lightweight lokta, and office papers. Original collograph of skeletal leaves collected near the Blue Ridge Parkway printed on a Vandercook press. Handwritten text. Sections of the US Geological Survey topographical map surrounding Boone, North Carolina, inkjet printed. Bound in paper-covered museum board with paper title on front board and similar layered paper decoration on back board. Signed and numbered. Sharon Sharp: "I've lived near the Blue Ridge Parkway for more than twenty years in North Carolina, as well as for three years in Virginia, and the verdant land continually mesmerizes me. The abundance and variety of trees fascinate me, especially as green bounty bursts forth each spring and refines the land's contours. I expect I'll always have to rely on my trusty tree-identification book while on drives and walks – and that prospect only increases this area's allure for me." 3 x 3"; 9 leaves. Handwritten text. Papers: parchment calligraphy, origami, Strathmore petal-inclusion, Canson Mi-Teintes, Thai leaf-inclusion, and unryu. Coptic stitched stiff wraps. Button and tassel closure. Linen thread tassel with glass bead adornment. Sharon A. Sharp: "Writing and printing by hand have always been relaxing for me, and I especially enjoy creating unusual forms through combinations of printing and cursive writing. In this playful word puzzle book, the reader will find – by reading in a different way – one glimpse of an autumn scene. 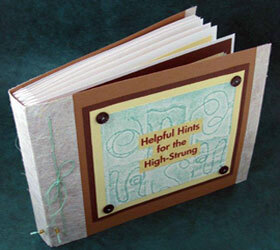 This book is the first in a planned series with handwritten letter and word exploration." At first glance the capital A looks as though it is presented in eight different decorated ways. On closer inspection one finds that the curlicues are not curlicues at all but letters. Each illustrated A has a hidden word – Amid airy allée, ants amass atop aged apple. Boone, North Carolina: Curious Pursuits Press, 2007. One-of-a-Kind. 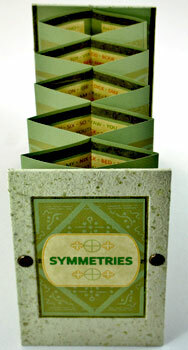 4 x 8 x 1" closed; opens to 9 x 8 x 4". Accordion structure with three tunnel sections. Materials: lokta, unryu, Southworth, and Konemann papers; metal fasteners; binder's board; Irish linen thread; decorative nylon ribbons; glass and metal beads. Processes: archival inkjet printing of the title, the alphabetic text, and original photographs for the tunnel sections. Paper-covered boards with title label tipped on front cover. Thread and hook closure. Signed and dated by the artist. Sharon Sharp: "I'm intrigued by how easy it is to categorize the things we encounter as either 'simple' or 'complex', when in fact simplicity and complexity mingle and dance, sway and embrace. If I open to that awareness, I'm continually pulled into realms of wonder, the mysterious wellsprings suggested in Source Notes. The title and the lengthy subtitle introduce the viewer-reader to this book in a way that book-titling conventions up to and through the 18th century were intended to do, by explaining the volume's scope. 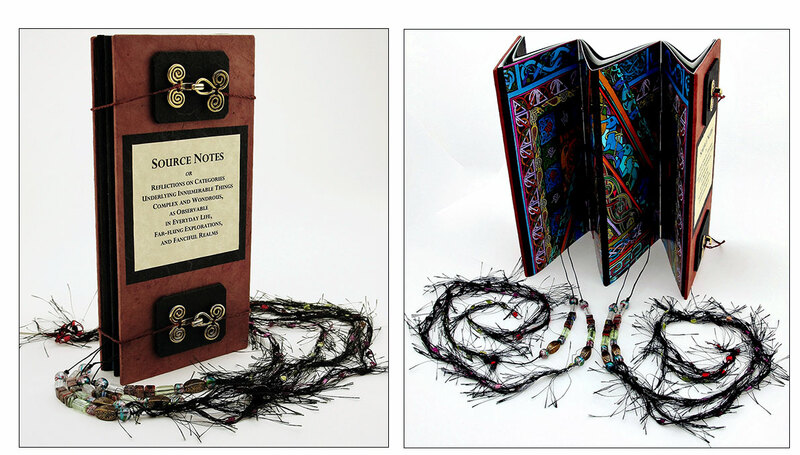 In this case, though, the reader-viewer, having opened the book, is invited to let imaginative play shape her or his own narrative, which might even incorporate the sinuous beaded ribbons." Boone, North Carolina: [Curious Pursuits Press], 2005. Edition of 30. 2.625 x 3.875" closed, extends to 10"; 18 pages. Interlocking accordions and two pamphlet-stitched signatures. Mohawk cover-weight, Canson Mi-Tientes, Thai unryu, and office papers. Original linocut printed on a Vandercook press. Text: handwritten and inkjet printed. 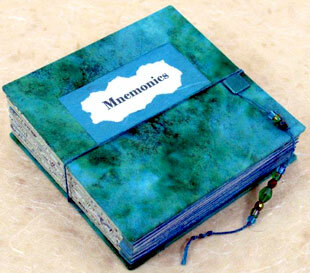 Bound in blue papers with metal brad and metallic thread closure. Glass bead adornment on tassel closure. Sharon Sharp: "This book is a meditation on water's powerful, mysterious role in our lives and language. 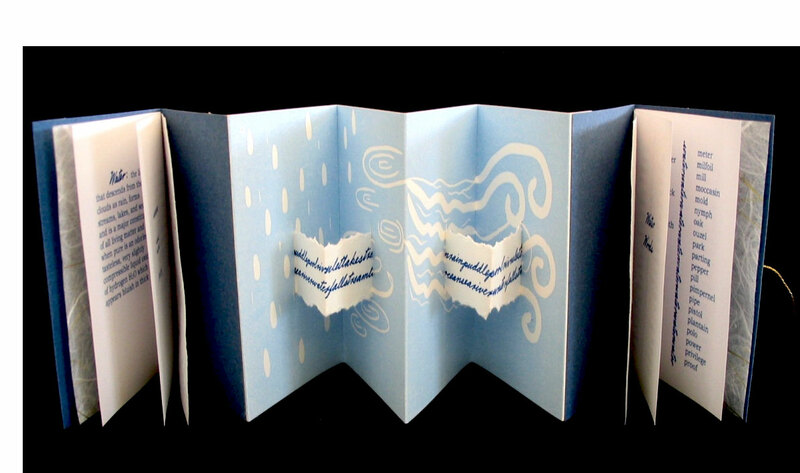 The wonder of the hydrologic cycle is represented on the smaller, torn edged accordion filled with handwriting, and water's infusion of our language is celebrated in the single signature pamphlets. "One suggestion for readers: To enjoy the first signature even more, write down your definition of water before reading this portion of the book." Boone, North Carolina: Curious Pursuits Press, 2010. One-of-a-Kind. 7.25 x 3 X 1.5" closed, extends to 7.25 x 17.25"; 6 panels. Jacob's ladder. Text on ribbons. 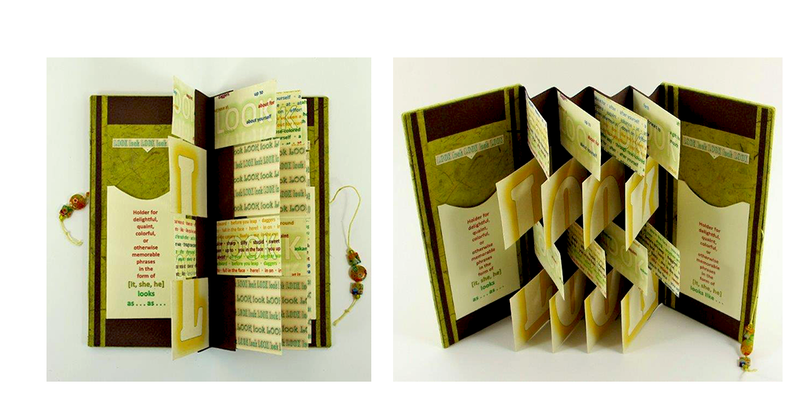 Wooden blocks covered with Caspari (green) and Bertini (gold-accented print) papers, grosgrain ribbon, metallic pen for handwritten text. 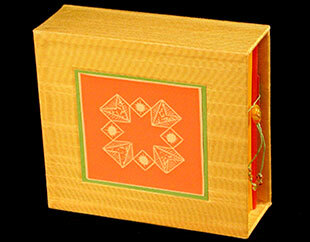 Laid in a matching panel and paper wrapper with ribbon and bone clasp closure. Sharon Sharp: "As I handled a traditional wooden toy called a Jacob's ladder and watched the panels flip, the theme of 'change and discovery' came to mind for this book. 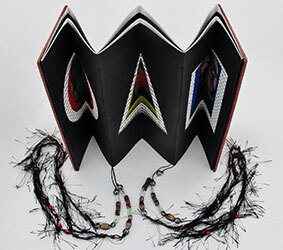 As the book is flipped so that the panels turn, the papers' patterns suggest the theme; and the words on the ribbons, which weave around and connect the panels, address the theme both directly and through their movement, as they shift, disappear, and reemerge. Using both hands, grasp the left and right sides of the top panel, about midway along each side, so that the text To change, seek discovery . . . faces you. Let all of the other panels simply hang down below this one. Slowly turn the top panel away from you and downward until the other panels begin flipping downward, one after the other. (If the flipping pauses, simply give the top panel a gentle shake until the motion resumes.) Continue to hold the top panel. After the other panels have stopped flipping, turn the top panel toward you and downward, starting another cycle of panel flipping. 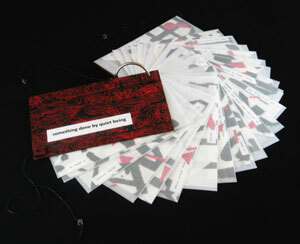 Continue with this back-and-forth process as you take in the words (30 in all) along the ribbons. To read all of those words, pause between 'flip cycles' and look at the words on both sides of the fully extended book. " Boone, North Carolina: Curious Pursuits Press, 2012. Edition of 5. 1.5625 x 1.5625; opens to 4" wide; 12 pages. Flower fold (origami style) miniature. Canson Mi-Teintes with original linocuts of crazy-quilt patterns (printed on a Vandercook press). 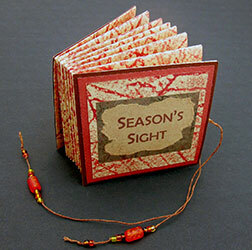 Materials: origami papers, unryu with metallic threads, marbled momi, Irish linen thread, glass bead, binder's board. 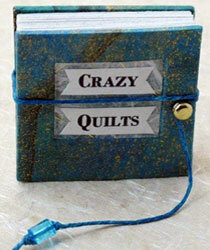 Handwritten text about crazy quilts and common embroidery stitches used. Hand script to represent embroidery-handwriting. Written with Sakura Pigma Micron pens. Bound in paper covered boards with tie closure. Title on front cover printed with archival inkjet. Sharon Sharp: "Crazy Quilts celebrates both 19th-century crazy-quilt traditions and the crazy quilts my maternal grandmother created. 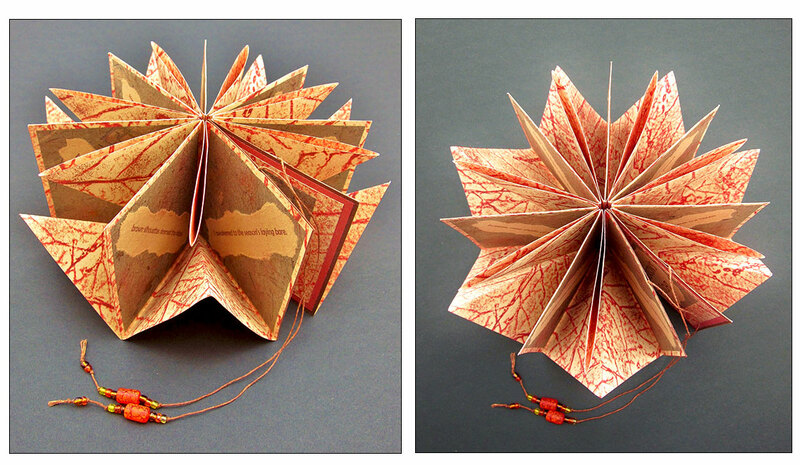 The look of fabric remnants is reflected in two ways: original linocuts of crazy-quilt blocks in the center of the book and 12 origami papers on the upper and lower book portions. Handwritten text, in angled lines, suggests the intricate embroidery stitches between a crazy quilt's many asymmetrical shapes and conveys historical and personal details related to such quilts. Since embroidery was integral to crazy quilts, many stitch names are presented. The book's varied movements also reflect crazy quilts' fascinating arrays of colors and designs." 9.5 x 11.125h x 1"; 14 pages. Crossed-structure. Materials: unryu, origami, heavy-fiber kozo, woven bamboo, batik, Momigami, printed Indian cotton, handmade cotton, vellum, metallic-flecked cotton, marbled lokta, Thai kozo with plant inclusions, Canson Mi-Teintes, Canford, office papers, Irish linen thread. Handwritten text throughout the book. Inkjet-printed text for the first signature's computer-screen image. Colored-pencil drawing and highlighting. Embossing. Bound in stiff paper wraps with layers of paper background papers tipped on with title label. Sharon Sharp: "As a dog lover, I wanted to celebrate my furry companion's exuberant greetings, especially since I'm already convinced of what a growing number of scientific studies have been indicating: animal companions reduce stress, boost optimism, and enhance healing for us." Boone, North Carolina: Curious Pursuits Press, 2006. One-of-a-Kind. 6.125 x 4.5" closed, opens to 6.125 x 22 x 3"; 6 leaves. 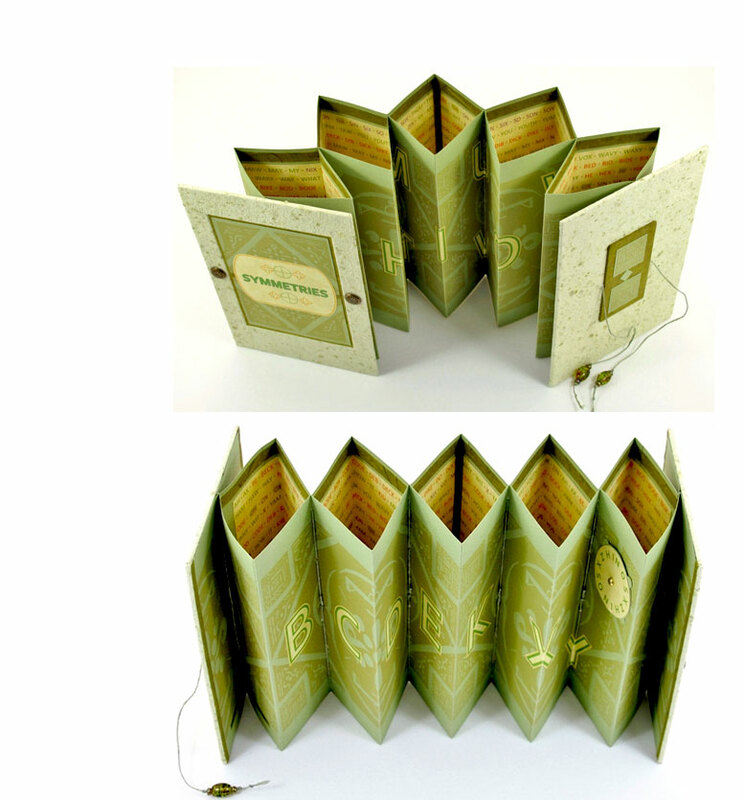 Panorama structure (accordion structure with a variation on a floating binding structure originally designed by Hedi Kyle). Lokta and Mohawk cover-weight papers. Original collograph created on a Vandercook press with Van Son printing inks. Original gelatin prints created with silkscreen ink. Bound in paper-covered boards with paper title label in Morse Code tipped on front board. Signed and dated by the artist. Sharon Sharp: "Each night, I see vibrant, odd scenes and hear equally evocative sounds somehow connected to my life; and each morning I ask, How should I interpret those dreams?What messages do the complex scenes and surprising snippets carry for me? Why are powerful feelings sometimes what linger most? Such questions led me to use Morse code for this book's only text, the title. The nature of many dreams seemed to fit with aspects of Morse code, especially in the need for deciphering and the potential for conveying volumes through the simplest symbols' combinations. Visually, the code has a certain synesthetic quality; aurally, it has a minimalist, hypnotic musicality, as is often true with dream sounds. Inside, the movable gelatin prints represent a progression, but with spaces between the shifting images as one dream-story unfolds and then morphs into another. With its threadlike imagery, the collograph suggests the underlying connections that draw me into interpretive quests." 6.375 x 7.5" closed, extends to 13.125 x 17": one opening. Envelope fold with button and tie closure. Materials: Canford, unryu, and office papers; Irish linen thread; glass bead; button. Processes: archival inkjet printing of the title and the text. Sharon Sharp has written a poem in praise of the place of the En Dash usage. The En Dash was originally named for width of capital N (1/2 width of M) in any given typeface, in metal type. 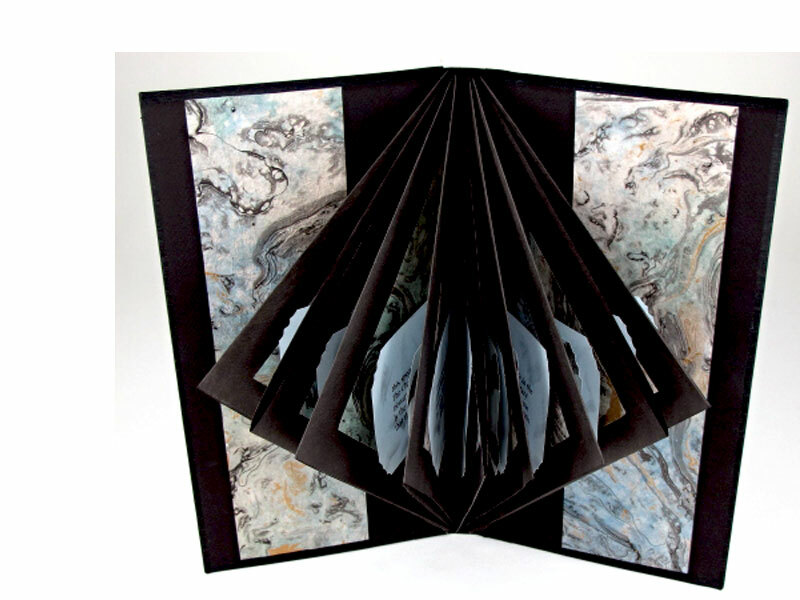 Sharon Sharp: "Before entering book arts, I worked for almost thirty years as a freelance editor for HarperCollins, Addison Wesley, and other publishers, with a focus on nonfiction trade books. Also, I taught editing at the college level for nine years. Immersed in The Chicago Manual of Style and other such guides, I grew ever fonder of certain punctuation marks and aware of their underestimated value. 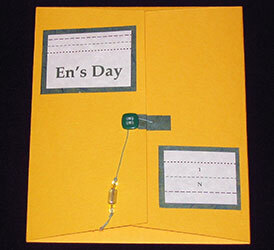 En's Day pays homage to the mark that almost inspired me to incorporate its name when I was selecting a press name. Even though the humble en did not win out in that case, I still hold it in high regard." 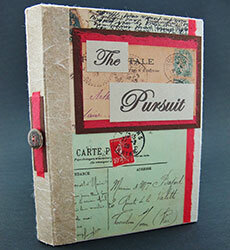 Boone, North Carolina: Curious Pursuits Press, 2013. One-of-a-Kind. 9 x 4.75 closed, opens to 9 x 23" x 4.5"; 10 pages. Flag structure. Canson Mi-Teintes, printed Momi, leaf-inclusion printed Strathmore, and office papers. Archival inkjet printing of original poem and of scanned original pen-and-ink drawing. Bound in paper-covered binders' board with paper title label on front board. Closure of Irish linen thread and metal brads. Glass bead accents on thread tie. Signed by the artist. Sharon Sharp: "Through drawings, a poem, and the overall form, Freehand celebrates our ways of opening to rhythmic sounds in nature, in ourselves, and in interactions. Each day becomes an invitation to pause, breathe deeply, listen, share. Leading from one to another, the mandala-like opened hands - repetitions of an original pen-and-ink drawing - represent the ways in which life energy is gathered inward and radiated outward, sparking synergies that draw us together and expand awareness. Because of the flag-book form, the poem's lines and the hand images have linked movements that are both patterned and fluid." Boone, North Carolina: Curious Pursuits Press, 2009. One-of-a-Kind. 5.25 x 8.5 x 2.25" closed, opens to 15 x 8.5 x 5"; 10 pages. Flag book. Printed on Southworth printing papers. Illustrations on transparency film. Laser and inkjet printed. 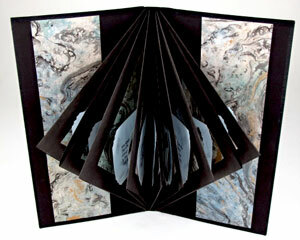 Bound in black stiff wraps covered with Indian metallic-marbled cotton papers. Magnet closures at spine. Red satin ribbon tie closure at foredges. Bead adornments on ribbon. Sharon A. Sharp: "While serving as Mammoth Cave National Park's 2009 artist-in residence, I learned a lot about bats and their remarkable traits, as well as about the virulent disease, white-nose syndrome, that now threatens their existence. I became interested in how Westerners' and Easterners' perceptions of bats have taken shape and in why they have contrasted so sharply. Since we Westerners have all too often demonized these invaluable mammals, their survival may hinge on shifts in our understanding of them. "To open this book, gently untie the ribbon bow, then gently pull apart the two pieces at the spine, each of which contains a magnet. 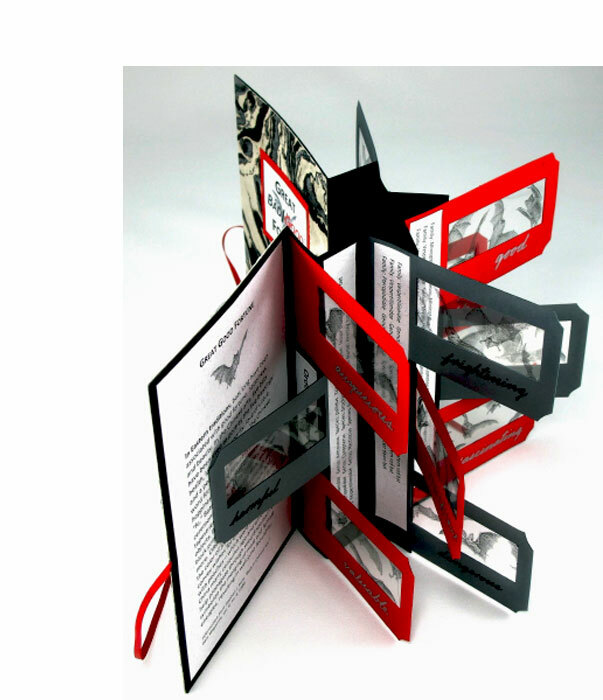 Although this book can be viewed and read with the magnetized spine closures together, the best display generally is a full opening." Boone, North Carolina: Curious Pursuits Press, 2015. One-of-a-Kind. 14.5 x 5.675", opens to 24 x 5.675 x 14.5". 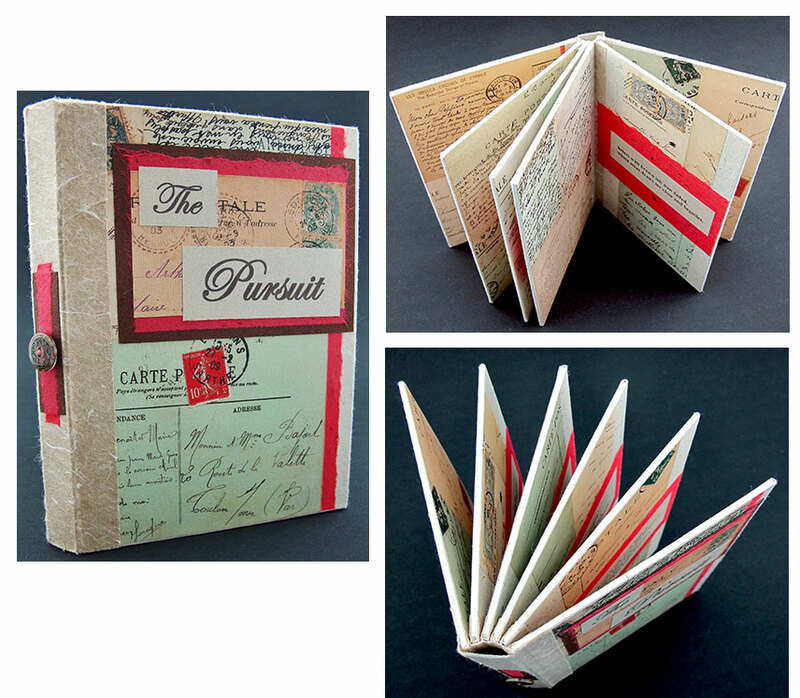 Pamphlet-stitched hard cover with interlocking imagery panels and fold-out text panel. Materials: Canson Mi-Teintes, banana-fiber with mulberry, momi, and Southworth papers; museum board; Irish linen thread; glass and stone beads. Processes: layered archival inkjet printing of an original photograph on top of a scanned collograph, which had been created by the artist and printed on a Vandercook press; colored-pencil highlights; archival inkjet printing of text and book title. Signed by the artist. Sharon Sharp: "Reading about streptomycin's discovery inspired me to learn more about the wealth of soil microbes crucial to antibiotics and other medicines. Recent research to identify more soil microbes, analyze their DNA, and develop new medicines has led some scientists to refer to soil microbes as the rich 'biosynthetic dark matter' underfoot — as intriguing as the dark matter in outer space. The stunning extent soil's untapped potential became the focus of this book's central text, an original poem that is a call for our protection of this critical resource and all it provides. Also, I wanted to encourage people to participate in the citizen-scientist initiative called 'Drugs from Dirt,' an important global soil-mapping effort. I created this book for the 2015 interdisciplinary, international exhibition Dirt? Scientists, Artists, and Poets Reflect on Soil and Our Environment, which was held at the University of Puget Sound (Tacoma, WA)." 10.75 x 7.75 x 1.375"; 7 leaves. Crossed-structure binding. Original collographs, Irish linen thread, glassine envelopes, glass beads, and buttons. Awagami Kinwashi, unryu, Tiziano, Folio, and Canson Mi-Teintes papers. On 6 of the pages, text appears on both sides of a removable thaumatrope (optical-illusion device) housed in a glassine envelope. Each thaumatrope is to be spun by the reader. Sharon Sharp: "As a child, I had a toy that allowed me, figuratively, to put a bird inside a cage by rapidly spinning a card on which a drawing of each object appeared separately on the card's faces. 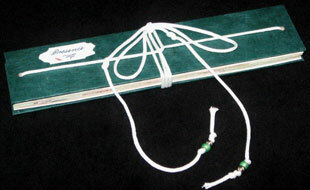 Over time, I've become increasingly intrigued by the optical-illusion toy known as the thaumatrope. Helpful Hints for the High-Strung opens with instructions on how to use the book's six thaumatropes - six keys to relaxation - and an afterword contains information about thaumatropes' history and underlying principles." Boone, North Carolina: Curious Pursuits Press, 2012. One-of-a-Kind. 10.25 x 4.875"; opens to 10.25 x 21 x 3.5"; 6 pages. Accordion structure. Movable features and pop-up elements. Colored pencil drawings. Handwritten text with Sakura Pigma Micron pens. Papers: Fabriano Ingres, Canson Mi-Teintes, printed lokta, kozo chiri, kozo with banana fibers (two kinds), unryu with threads, kozo with mango leaves, kozo with water hyacinth fibers, ogura lace hemp, Strathmore textured, Strathmore petal inclusion, origami, and Mohawk. Other materials: metal brad and binders' board. 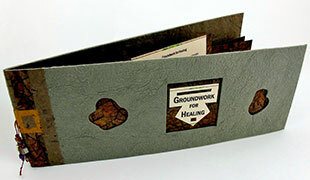 Bound in papercovered boards with archival inkjet printed title on front board. Sharon Sharp: "As a gardener, I began reflecting on the wonders of soil, the resource supporting the world's food crops, forests, and more. In learning details, though, I realized just how little I (and most others) know about this crucial, varied, threatened realm so vital to countless aspects of life. This book became an invitation for others to join me in exploring the small amount of soil on Earth, the wonders of soil's key features, and the complexities of soil horizons, or layers. "The content is presented through multiple movable elements. The two left-section panels of the accordion contain a volvelle, a turning circle, a dissolve, and other text about soil's key features, its distribution on the planet, and its importance in sustaining various life forms. 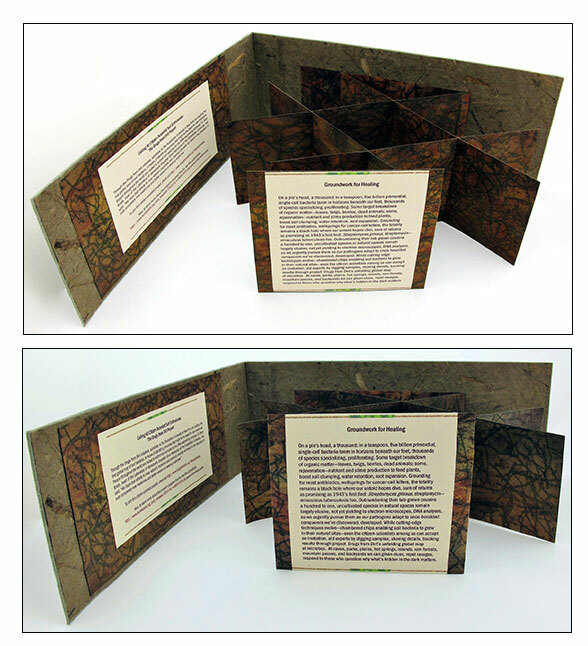 A central multifold feature with plant-like cutouts accents the layered-paper depiction of soil horizons, and a small pop-up feature highlights an amazing fact about soil formation. 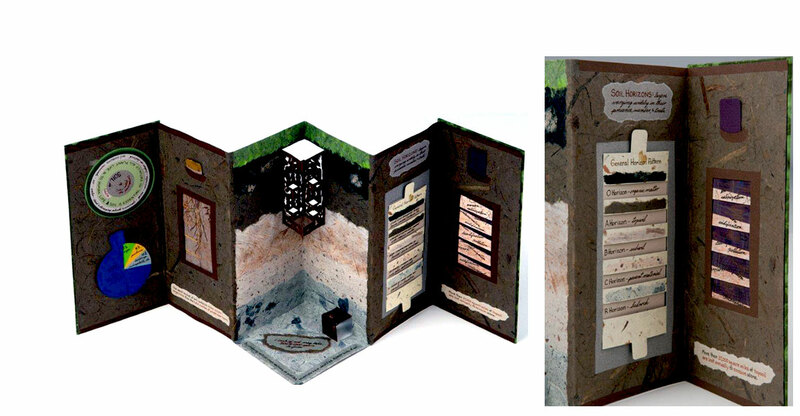 The two right-section panels contain a sliding mechanism with details on soil horizons, papers keyed to the central panels' paper-layer horizons, and a dissolve depicting soil degradation and depletion. I hope that Hidden Horizons will spark curiosity and wonder, leading, in turn, to greater concern for protecting our world's soil reserves." Boone, North Carolina: Sharon A. Sharp, 2010. One-of-a-Kind. 6.75 x 12.75" closed, opens to 12.75 x 12.75 x 6.5"; 38 pages. 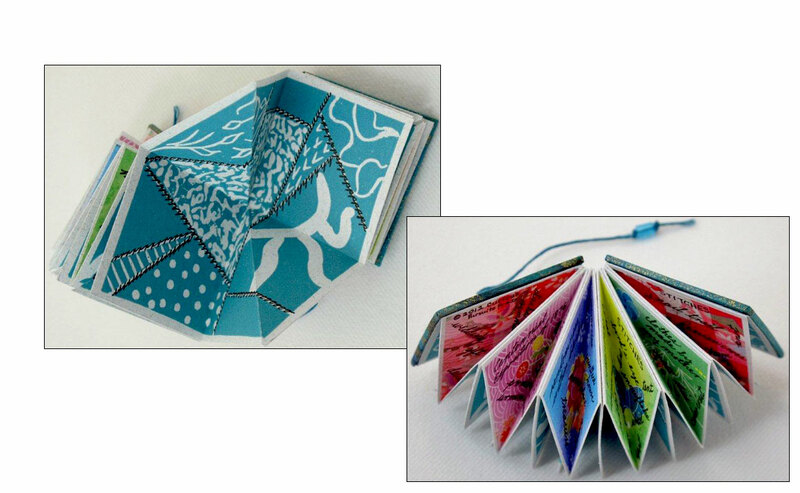 Tumble/flutter book. Inkjet printed images and text on Southworth office paper. Thai marble momi papers tipped on interior pages and pastedowns. Bound using black tyvek. Bound in Asahi bookcloth over binder's board. Metal brad and Irish linen thread closure with glass bead adornment. Sharon A. Sharp: "While serving as Mammoth Cave National Park's 2009 artist in residence, I learned a lot about bats and their remarkable traits, as well as about a virulent disease, white nose syndrome, that now threatens their existence. Since our linguistic associations often shape our interest in protecting animals, I wanted to explore how our perceptions of bats and even of their name have taken shape. (Also, I welcome any good reason to plunge into the history of words.) Upon learning that bats were once referred to as 'flutter mice,' I wanted to use a book form that would suggest the movements and shape of these enigmatic mammals." Boone, North Carolina: Curious Pursuits Press, 2012. Edition of 25. 3 x 2.625"; 26 pages. 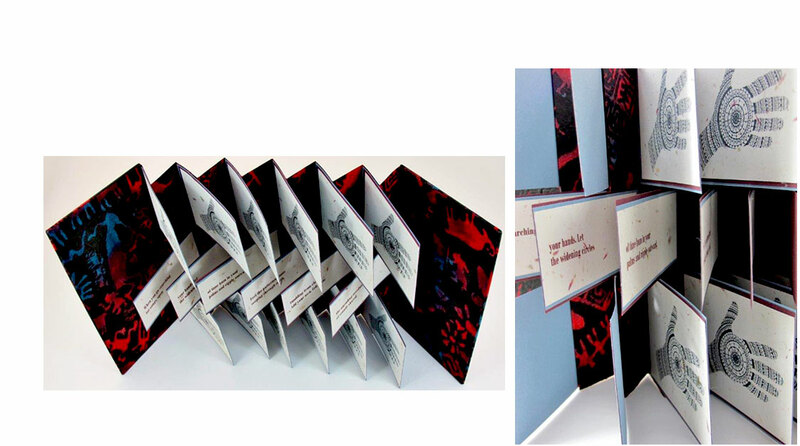 Accordion structure with opening and closing pamphlet stitched sections. Archival inkjet printed text in Goudy Old Style. Handwritten edits with archival Micron pens. Papers: unryu fly leaves; unryu and Bertini-paper accents on interior and back of accordion panels; cream-colored Mohawk Superfine lightweight paper for text. 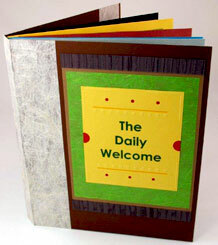 Bound in paper covered binder's boards with Bertini gold-accented-design paper. Archival inkjet-printed title on Mohawk Superfine cover-weight paper, tipped onto coral Mi-Teintes panel. Handcut simulated colored pencil inset on green unryu on bottom of front board. Closure of metal brad with green Irish linen thread and glass beads adornment. Pamphlet stitching with unwaxed Irish linen thread. Signed and numbered by the artist on the copyright page. Sharon Sharp: "The Incompleat Editor is a persona, an overzealous neophyte who allows me to take a tongue-in-cheek look at copyeditors' and line editors' self-assured drive to 'improve' others' writing. I enjoy playing with this persona because for thirty years I've had to hold in check the 'improvement imperative' while editing nonfiction books for various publishers. 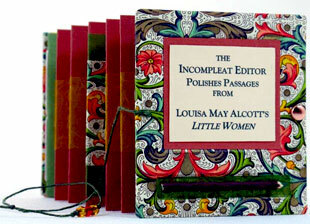 The Incompleat Editor's suggestions are also reminders that each writer's unique voice must be honored as the very heart of any literary work, and in this case it is Louisa May Alcott to whom I must apologize for the editor's brash insensitivity. 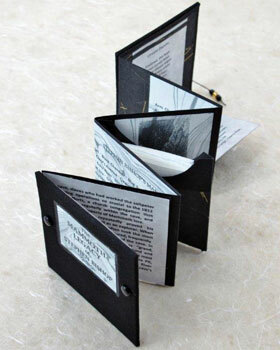 As noted in the book's introduction, this is the first edition in a planned series of Incompleat Editor miniature books using text from selected literary classics with little or a similar word in the title. The tiny pencil on the cover represents my many years of editing with colored pencils on hard copy, plus it's a nod to my ongoing delight in the visual rhythms of editors'/proofreaders' marks, now almost obsolete." 7.25 x 3.375" closed, opens to 7.25 x 9.5 x 2.5". Flag book structure. Papers: banana-bark kozo, chiri, unryu, Canson Mi-Tientes, and Southworth. Archival inkjet printed. 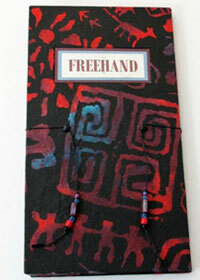 Other materials: metal brads, Irish linen thread, glass beads, binder's board. Brad and thread closure. Paper title label on front cover. Signed and dated by the artist. Sharon Sharp: "While searching for some sparkling word in my thesaurus, I was struck by how richly the word look infuses and energizes the English language. Phrases with look often seem to be bridges – ones between our visual and auditory ways of experiencing language, as well as ones between our observations, feelings, and actions. In fact, the associations evoked by many look phrases are surprisingly vivid and even visceral. The movements of this book's flag structure suggest both how our attention shifts as we read and how language, as an organic realm, continually changes. 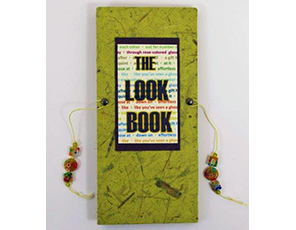 Two pockets in The Look Book invite reader-viewers to insert look-related phrases that may pop to mind." Boone, North Carolina: Curious Pursuits Press, 2012. Edition of 10. 3 x 2.875" closed, opens to 3 x 14"; 18 pages. 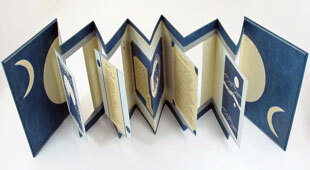 Double-sided accordion with a pamphlet-stitched opening section, a stitched-in pocket holding a folded map portion in the middle section, and a fold-down poem in the last section. Canson Mi-Teintes, unryu with metallic strands, white laid-finish, and gray parchment papers. Archival (pigment-type) inkjet printing of text, map portion, and images of 19th-century Mammoth Cave engravings and lithographs atop scans of original suminagashi. Other materials: Irish linen thread; binders' board; metal brads; glass beads. Bound in black cloth with thread and bead closure on each side. Signed and numbered by the artist. Sharon Sharp: "South-central Kentucky's Mammoth Cave - the world's longest known cave system - has become a powerful source of inspiration because of my 2009 opportunity to serve as Mammoth Cave National Park's Artist-in-Residence. One of the most remarkable people in the cave's history was Stephen Bishop, an enslaved 19th-century African-American guide and explorer who gained international renown for his knowledge, courage, and wit. Using rudimentary tools and often exploring alone, Bishop discovered many major cave areas, as well as eyeless fish and other unusual creatures. One of Bishop's most striking accomplishments was the completion of a detailed map - drawn from memory - of the cave passages he had explored by the light of a small lard-oil lantern. That map, completed for his owner, eventually became a central part of the legacy now celebrated at Mammoth Cave National Park, where he is buried. "The front side of The Mammoth Legacy of Stephen Bishop contains a pamphlet-stitched booklet about Bishop and his work at the cave, a stitched-in pocket holding a portion of Bishop's famous cave map, a fold-out with an original poem (in a traditional Welsh form, cywydddeuairfyrion), an original drawing of a lard-oil lamp, and six archival inkjet prints of 19th-century Mammoth Cave etchings and engravings printed over scanned images of original suminagashi (ink marbling). The cave-interior place-names from Bishop's entire map appear on the accordion sections' back, and the glass beads on the front cover's closures suggest the guide's lantern light." 4 x 4 x 1.38" closed, opens to 10" (diameter when opened to form circle) x 4"; 8 leaves. Tulip-fold. Original collographs printed on Canson Mi-Teintes paper using a Vandercook press and Van Son inks. Printed Momi, unryu, and Southworth parchment papers. Archival inkjet printing of original poem, suminagashi image for kirigami forms, and map portions. Colored-pencil highlights on map areas. Bound in paper-covered binders' board with Irish linen thread and metal brad closure. Glass bead accents on linen thread. Paper title label inset on front board. Signed by the artist. Sharon Sharp: "During treks around Blue Ridge Mountain landscapes, I feel my breathing deepen and slow down, my senses sharpen and focus differently, and my thoughts settle into reflections on time's arc. The stones, the plants and animals, the streams and lakes, the skies, the land's curvature – all remind me anew about my immersion in the natural world's ancient, ongoing wonders and mysteries. Through an original poem, the various imagery techniques, and map images of the area where I live and feel centered, Mnemonics celebrates nature's revelatory power and my own place within the vastness." 8.25" x 35" x 5.875" extended. Panorama style. Papers: Tanabata, Tairei (2 variations), metallic Canford, and Canson calligraphy-parchment paper. Other materials: Irish linen thread, metallic brads, glass beads, and binder's board. 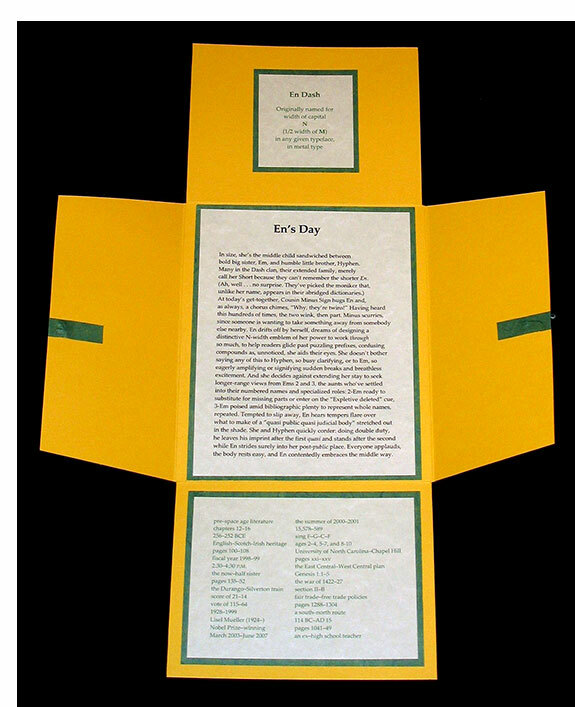 Printed archival inkjet: poems, prose elements, and book title. Handwritten text with Sakura Pigma pen on two linocuts. 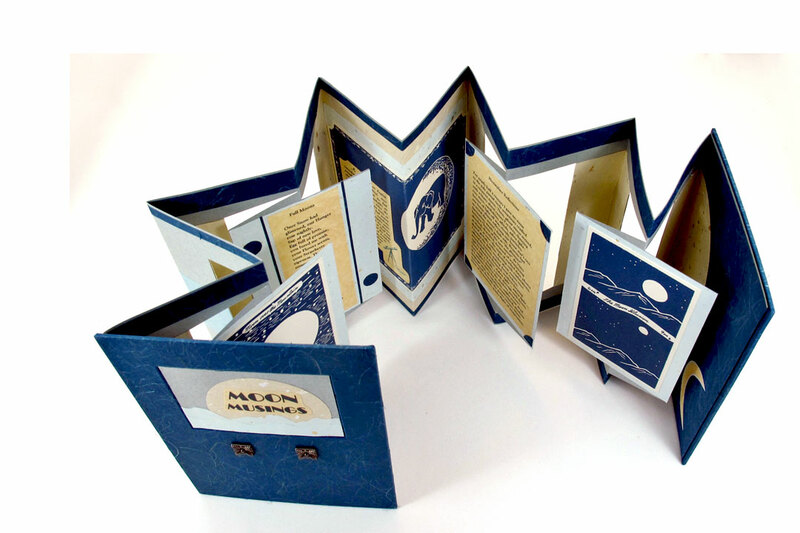 Sharon Sharp: "Moon Musings explores moon lore through three original linocuts, two original poems, and various prose elements. On the book's front side, one linocut depicts the Moon over the Mountain quilt pattern; another, the optical illusion known as 'the moon illusion'; and the third, a 17th-century naturalist's 'elephant in the moon' sighting, poetically satirized by Samuel Butler. One of the original poems celebrates love using names attributed to each month's full moon, and the other poem delves into the mesmerizing 'ghost moon' phenomenon. A description of the 17th-century naturalist's folly accompanies the related linocut. On the book's back, names of the lunar phases complement a Galileo quote regarding the moon's beauty. In terms of dominant colors, the book's front represents the moon's dark side, and the back (silver), its light side." 5.125 x 7"; 8 pages of binder's board. 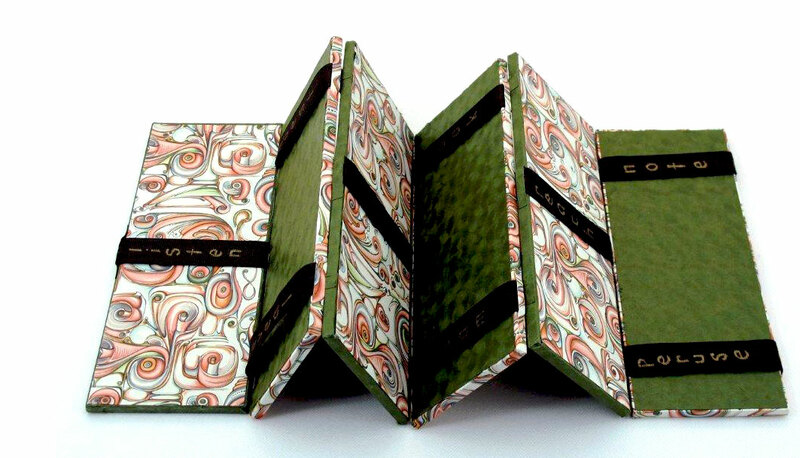 Bound in matching covered binder's board covers with paper spine and title tipped on front board. Materials: Florentine-print, chiri, and metallic-flecked-cotton papers; binder's board; decorative button. Processes: archival inkjet printing. Signed. Sharon Sharp: "Handwritten correspondence has a magnetic pull for me, especially if the letters or postcards reflect older writing styles, ink varieties, and writing instruments. I imagine what each letter writer was like and how the correspondents' relationship evolved. This has been particularly true whenever I've looked at correspondence between some of my ancestors, while I've been touching the actual pages they held and reading the handwriting that flowed from their hearts, minds, and hands. Sometimes, physical relics such as these can become clues to an intangible treasure, and I explore that idea in this book's original poem." The Pursuit, poem by Sharon A. Sharp, was first published in the North Carolina Poetry Society's collection Pinesong: Award-Winning Poems 2014. 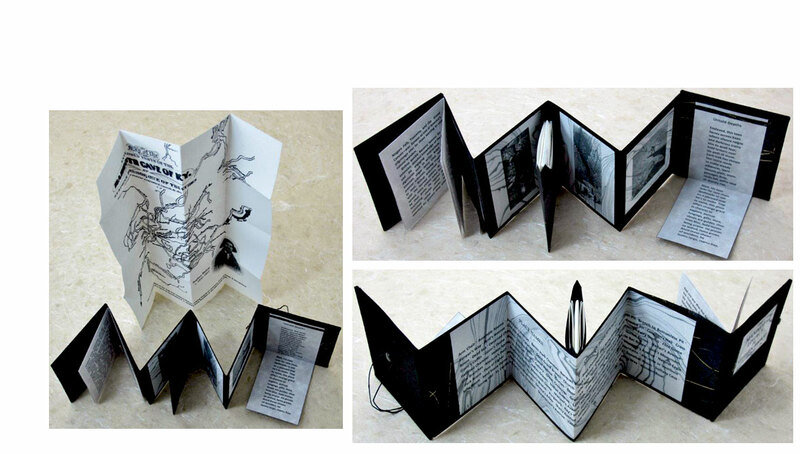 8.5 x 2" closed, 8.5 x 19"opened; 16 pages. Palm leaf structure. Lokta, watercolor, and Strathmore papers. Other materials: nylon-blend cord and beads. 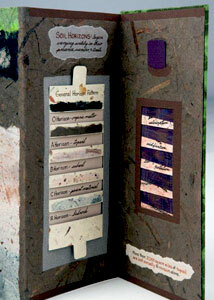 Processes: original poem handwritten on both sides of book; original watercolor. Sharon Sharp: "Experiences at a meditation retreat led to these reflections, in word and image, about the many different calls to present-moment awareness." 4.625 x 4.625" closed; extends to 18.25x 13.75". 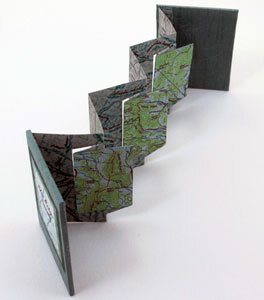 Map fold construction with two pamphlet-stitched sections. Slipcased. Materials: Tiziano, Canson, Canford, and unryu papers; original linocuts printed with Von Son inks on Mohawk Superfine paper; Irish linen thread; Asahi bookcloth and binder's board for slipcase. 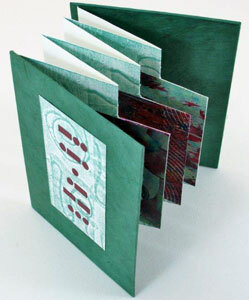 Processes: archival inkjet printing of title and text, which includes an original poem. Signed. Sharon Sharp: "Remnants Gathered is a tribute to family members whose quilts grace my life - my paternal great-grandmother, maternal grandmother, and mother-in-law. My maternal grandmother especially inspired me because, during my childhood, she shared her progress on every hand-stitched quilt top, whether a traditional pattern or a crazy quilt. The fabric remnants from clothes my mother made became part of each quilt, forming an intimate record of shared memories. 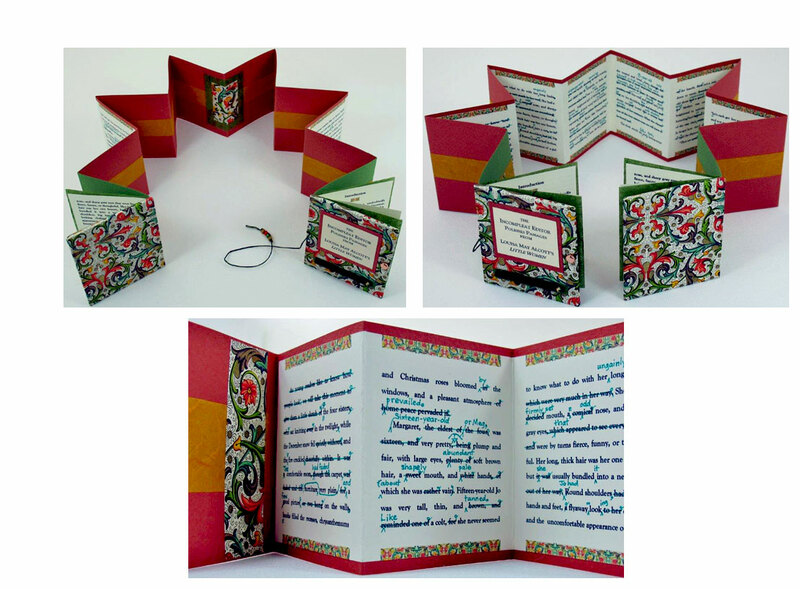 Through poetry, I write about my maternal grandmother's influence in Remnants Gathered, and I incorporate information and reflections from a dog-eared quilting book of hers, The Standard Book of Quilt Making and Collecting. 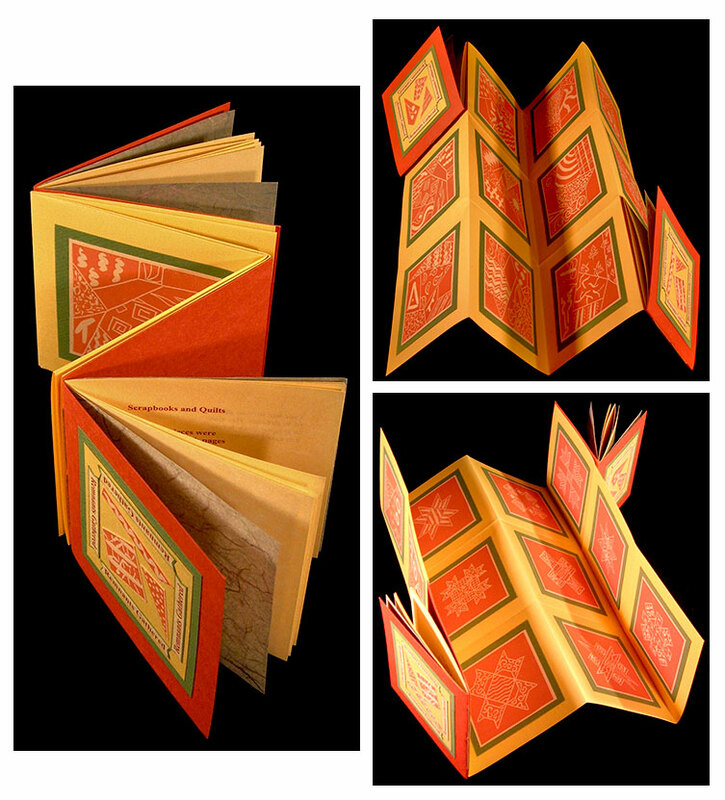 "The map-fold parts of this book contain, on one side, twelve linocuts of crazy-quilt designs and, on the other, ten of traditional quilt patterns. 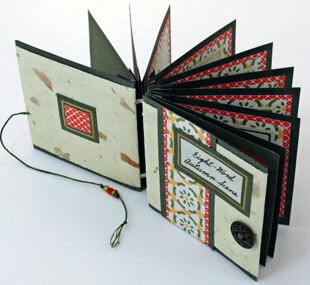 The attached pamphlet-stitched books contain original poetry and prose, both personal and general, about quilting. Remnants Gathered can be explored and displayed in various ways, and refolding the fully opened book reminds me of preparing a quilt for summer storage in an heirloom cedar chest. "Remnants Gathered was first published in Bay Leaves, the Poetry Council of North Council's collection of award-winning poems." Boone, North Carolina: Sharon A. Sharp, 2009. One-of-a-Kind. 3.625 x 6 x 1"; 46 pages. Fan book. Tibetan printed lokta, unryu rice, and Canford papers. Glassine envelope pages. Designs created with sumi-e ink. Text ink jet printed. Text in English and Morse code. Red paper shapes move freely within the envelopes. Bound in paper-covered museum board with single metal ring. Black Irish linen thread tie closure at opposite corner of ring. Embossed rectangle on front board containing paper title label. Sharon Sharp: "The title and text are from Lao-Tzu's Tao Te Ching, as translated by R. B. Blakney. Within the glassine envelopes, text appears in both Morse code and English, with each page containing a single word. 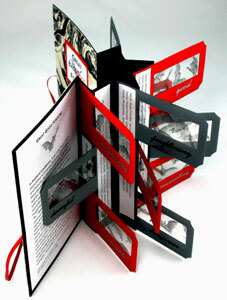 The reader is invited to fan through the pages from front to back and then turn the book over and continue reading. As in life, the excerpt's wisdom unfolds gradually, in fragmentary ways that reveal the whole." 6.375 x 4.374 x 14" extended. Papers: cotton Momi with crystallized mica, Canson Mi-Teintes, calligraphy parchment, unryu. Original linocut letterpress printed with Van Son ink on Mi-Teintes paper. 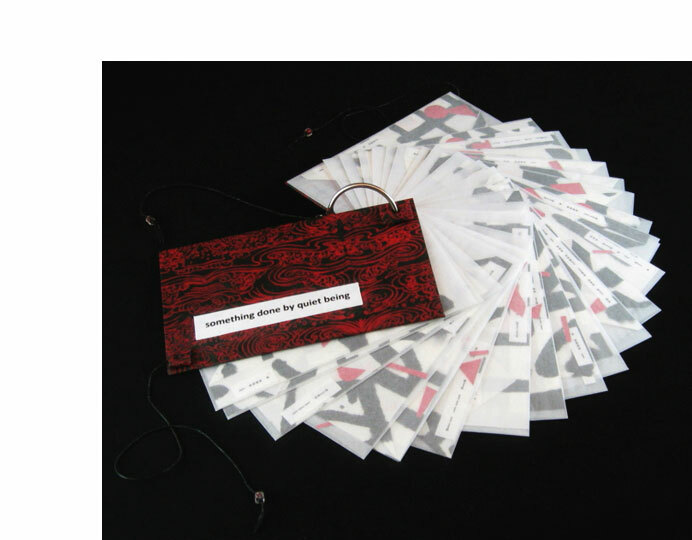 Text, title, and accompanying symbols produced with archival inkjet printing. Other materials: metal brads, Irish linen thread, glass beads, binder's board. Sharon Sharp: "Symmetries is a celebration of letter-, font-, and wordplay. Some wordplay springs from the fact that certain capital letters exhibit one or more types of symmetry – namely, vertical mirror symmetry, horizontal mirror symmetry, or rotational symmetry. 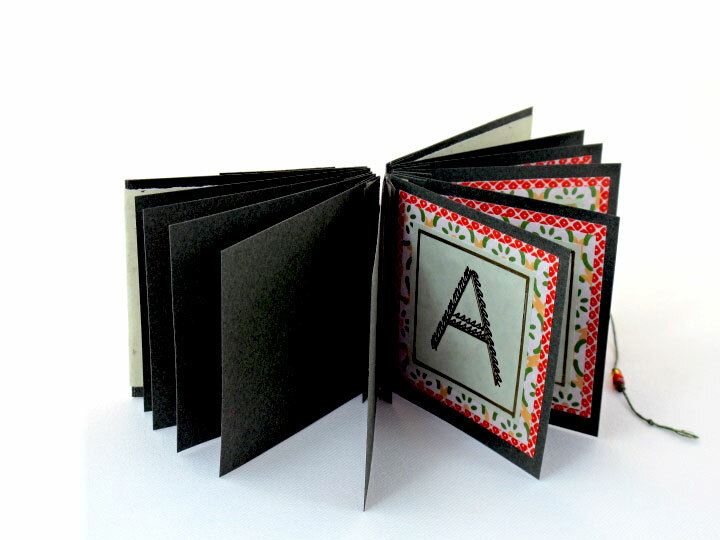 Described in this book's small pamphlet-stitched signature, these variations are also depicted through letter placements on the accordions' exterior surfaces. Via the sans serif Corbel font, the full complement of letters having symmetrical potential is shown through their positioning on the accordion sections, and the words created from those letters (as used only once in a word) appear on the accordions' interior surfaces. Letters with rotational symmetry appear on a small movable circle. I hope viewer-readers will leave this book thinking, which other fonts exhibit 'full symmetrical letter potential'? What if any given symmetrical letter could be used more than once in a word? What if ..."
What Is the Sound of Two Invisible Hands Clapping? 9.5 x 9.25 closed, extends to 55 x 9.25 x 18.175"; 15 pages. Accordion. Movable elements including Mylar hands, a turning wheel, and a sliding strip. Fold-down panels. 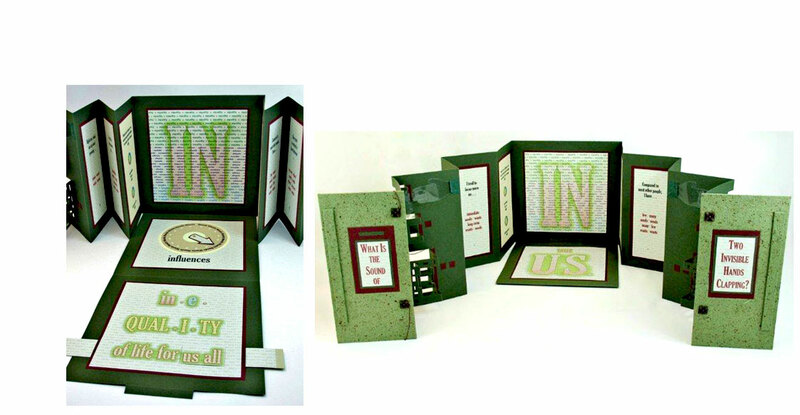 Pop-up features with cutouts. Papers: Canson Mi-Teintes, kozo with water hyacinth, heavyweight momi, and office papers. Other materials: binder's board; Irish linen thread; metal brads; Mylar. 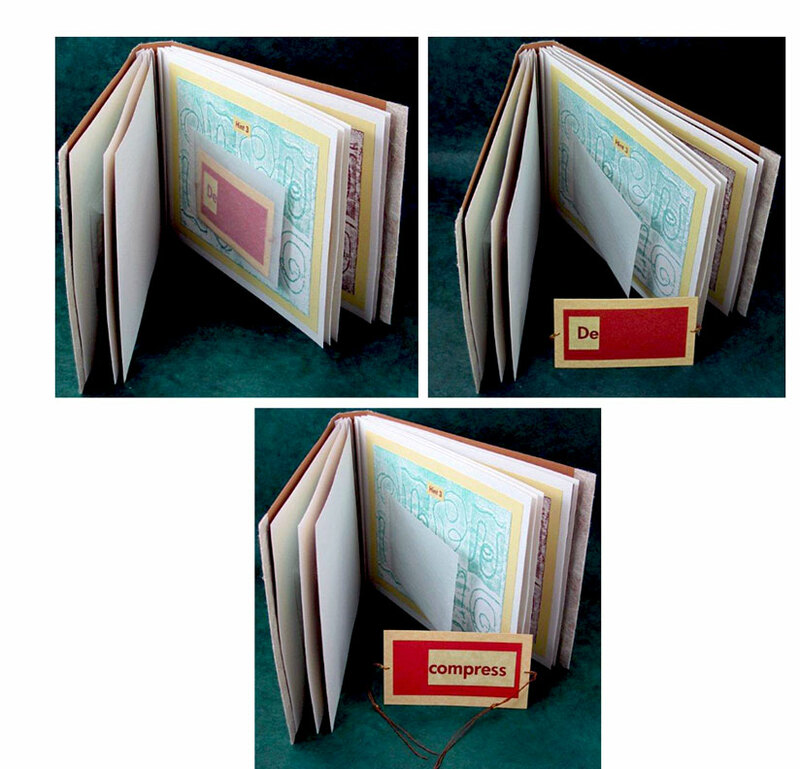 Bound in paper covered boards with tie and metal clasp closure. 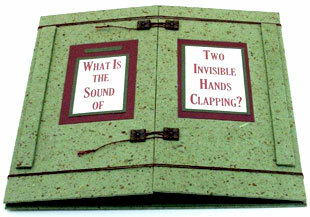 Sharon Sharp: "What Is the Sound of Two Invisible Hands Clapping? is an exploration of how we, as individuals, expand, blur, and redefine wants and needs while evaluating our own and society's levels of wealth, well-being, inequality, and fairness. What are the individual and collective consequences when we redefine something as a need that we once saw as a want? What shapes our approach to assessing and balancing individual and collective needs/wants? "This expanding, multipart book invites viewers to explore overlapping texts that convey multiple meanings and to consider personal questions framed within societal contexts, so that 'answers' will generate more questions." PoorQuality/Inequality exhibition, Duke University's Center for Advanced Hindsight, June 1 - August 31, 2012: "The ceaseless, complex interplay between needs and wants – and the resulting effects in economic terms – called to mind both Adam Smith's 'invisible hand' and the Zen koan about the 'sound of one hand clapping,' (thus the book's title). 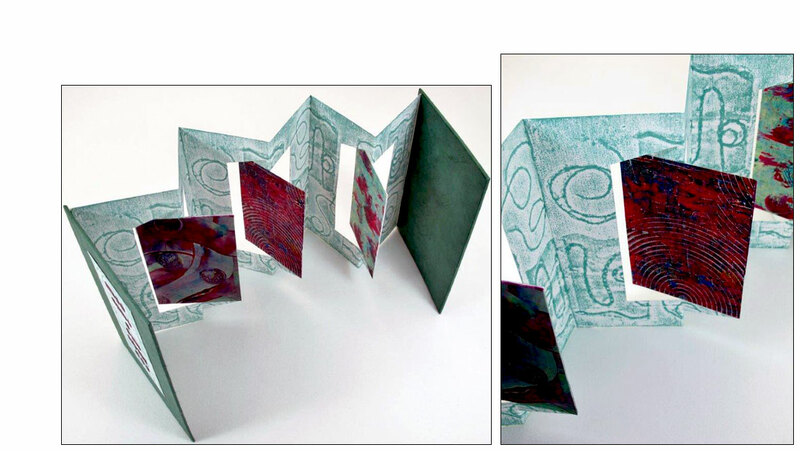 The accordion format, the pop-up features, and the fold-down panels all reflect the key terms' interrelatedness and invite viewers into a multifaceted textual experience."